The hotel is situated on the Ladies Beach Promenade, just 10 m from the sandy beach. 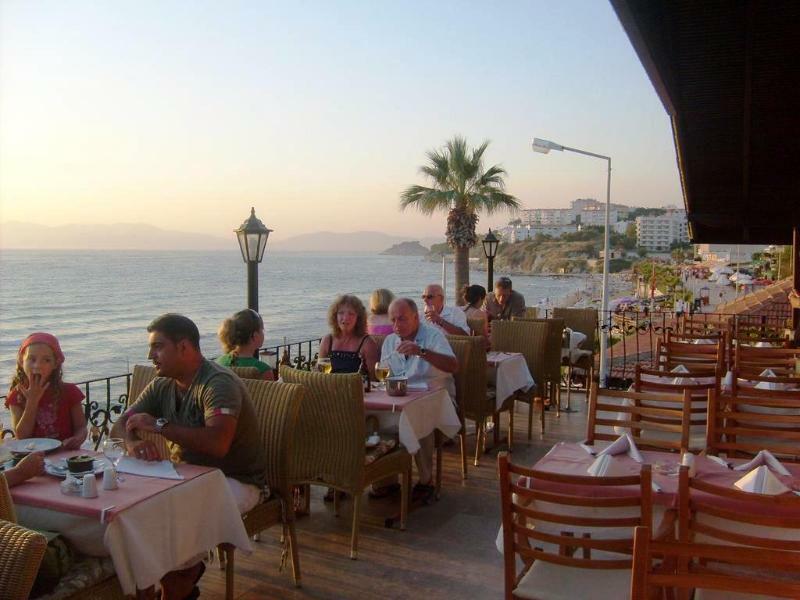 The town centre of Kusadasi is about 2.5 km from the property, and around 8 km to Izmir. Adnan Menderes Airport is approximately 75 km away and it is some 130 km to Milas Airport. 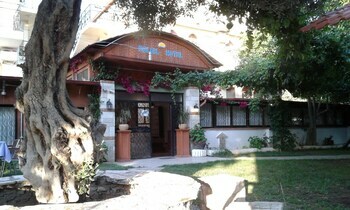 This beach hotel comprises a total of 9 rooms spread over 3 floors. The facilities on offer to guests include a TV lounge and a restaurant. All rooms come with an en- suite bathroom with a shower, individually adjustable air conditioning, and either a terrace or a balcony. Guests may select their continental breakfast from a buffet, and the midday and evening meals are available à la carte or from a set menu. 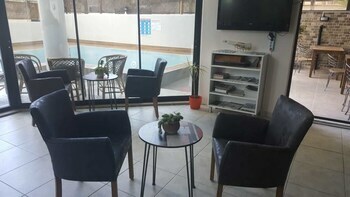 Property Location With a stay at Happy Apart in Kusadasi (Kusadasi City Centre), you'll be minutes from Ladies Beach and close to Yilanci Burnu. This aparthotel is within close proximity of Ataturk Hill and Kaleici Mosque.Rooms Make yourself at home in one of the 35 air-conditioned rooms featuring kitchens. Your room comes with a Select Comfort bed, and all rooms are furnished with double sofa beds. Rooms have private balconies. Complimentary wireless Internet access keeps you connected, and satellite programming is available for your entertainment.Rec, Spa, Premium Amenities Take advantage of recreation opportunities such as an outdoor pool or take in the view from a terrace and a garden. 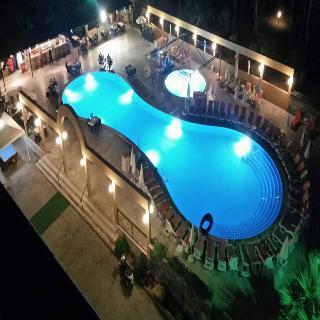 This Mediterranean aparthotel also features complimentary wireless Internet access and tour/ticket assistance.Dining Grab a bite to eat at one of the aparthotel's 2 restaurants and 2 coffee shops/cafés, or stay in and take advantage of 24-hour room service. When you are in need of a refreshing drink, visit a poolside bar or one of 2 bars/lounges, or 2 swim-up bars.Business, Other Amenities Featured amenities include dry cleaning/laundry services, a 24-hour front desk, and a safe deposit box at the front desk. A roundtrip airport shuttle is provided for a surcharge (available 24 hours), and free self parking is available onsite. 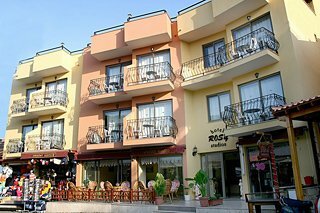 Property Location Tuntas Family Suites Kusadasi is centrally located in Kusadasi, walking distance from Ladies Beach and close to Yilanci Burnu. This 4-star resort is within close proximity of Ataturk Hill and Kaleici Mosque.Rooms Make yourself at home in one of the 70 air-conditioned rooms featuring kitchenettes. Your room comes with a pillowtop bed, and all rooms are furnished with double sofa beds. Rooms have private furnished balconies. Satellite television is provided for your entertainment.Rec, Spa, Premium Amenities Take advantage of recreation opportunities including an outdoor pool and bicycles to rent. This Art Deco resort also features complimentary wireless Internet access, concierge services, and shopping on site. The beach shuttle (surcharge) makes getting to the surf and sand a breeze.Dining Grab a bite to eat at the resort's restaurant, which features a bar, or stay in and take advantage of room service (during limited hours). Relax with a refreshing drink from a poolside bar or one of the 2 bars/lounges. Buffet breakfasts are available daily for a fee.Business, Other Amenities Featured amenities include dry cleaning/laundry services, a 24-hour front desk, and luggage storage. A roundtrip airport shuttle is provided for a surcharge (available on request), and free valet parking is available onsite. 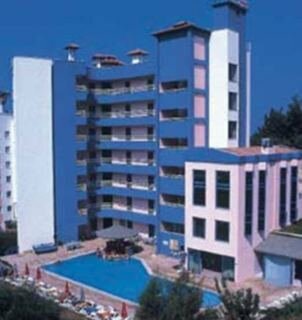 The hotel is set on a hill only 200 m from the sea and offers a superb view of sandy Ladies beach. 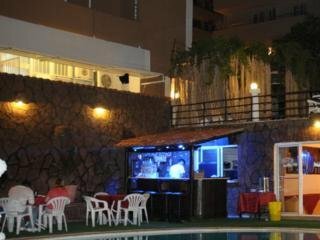 It is located in a quite area, yet is not far from a range of local bars, restaurants and shops. It is 20 minutes' walk from the centre of Kusadasi and Adnan Menderes Airport is approximately 90 km. Renovated in 2006, this apartment hotel offers a bar, a TV room and a restaurant. Each room comes with a direct dial telephone, a satellite/ cable TV, a kitchenette with a minibar. 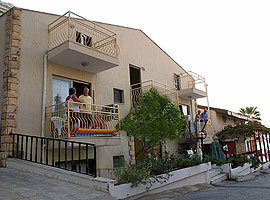 The air conditioning is individually regulated and rooms include a balcony. There is a swimming pool on the hotel grounds, complete with a poolside snack bar and parasols. A variety of water sports activities are also available in the local area for a small additional fee. Breakfast is served in the form of a buffet, while lunch and dinner may be either selected from a set menu or ordered à la carte.